The Cable Car Home Page - The Street Railway Situation in the Two Kansas Cities. The Street Railway Situation in the Two Kansas Cities. This article, from The Street Railway Journal, October, 1900, describes the transit situation in Kansas City, Missouri and Kansas. 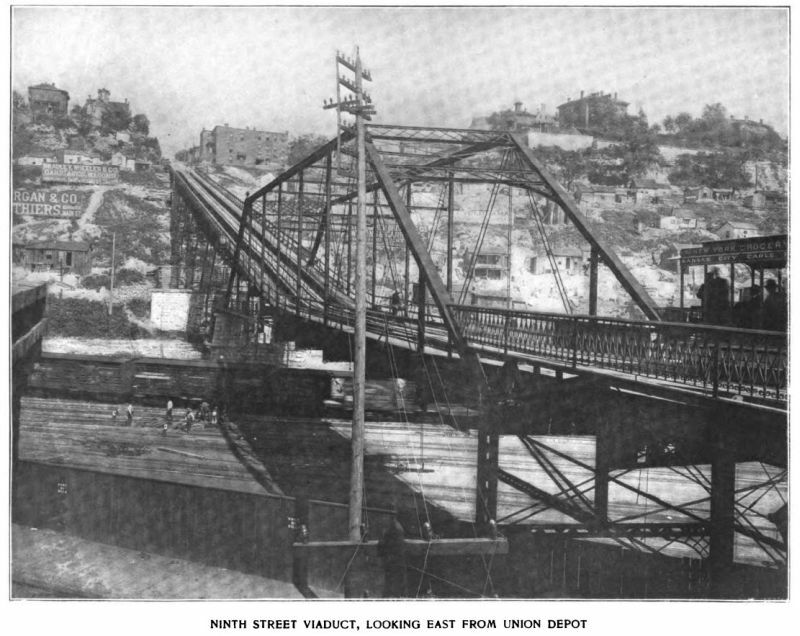 The unique topographical and other peculiar conditions of Kansas City have made the construction and operation of its street railway systems an unusually complex problem, and have developed many novel solutions of the problems presented. Forced by the very difficulties of their situation to adopt the very latest advances in the art of surface traction or to invent their own improvements on standard practice, the street railways of Kansas City have been as progressive as any in the continuous process of evolution of the last few years, and are now behind none in the application of the very latest improvements to apparatus and methods. Kansas City is located just on the State line between Kansas and Missour. This line divides the city into two separate cities with independent city governments. The larger of the two, and the one containing the business center and the best residence districts is Kansas City, Mo. ; The other, Kansas City, Kas., contains less expensive dwellings. The population of the two as given in the United States Census for 1900 is 215,000. The city is fundamentally a great railroad center, serving as a collecting, jobbing and distributing point for the highly cultivated agricultural sections of Kansas, Nebraska, the Indian Territory, Colorado and the western part of Missouri. 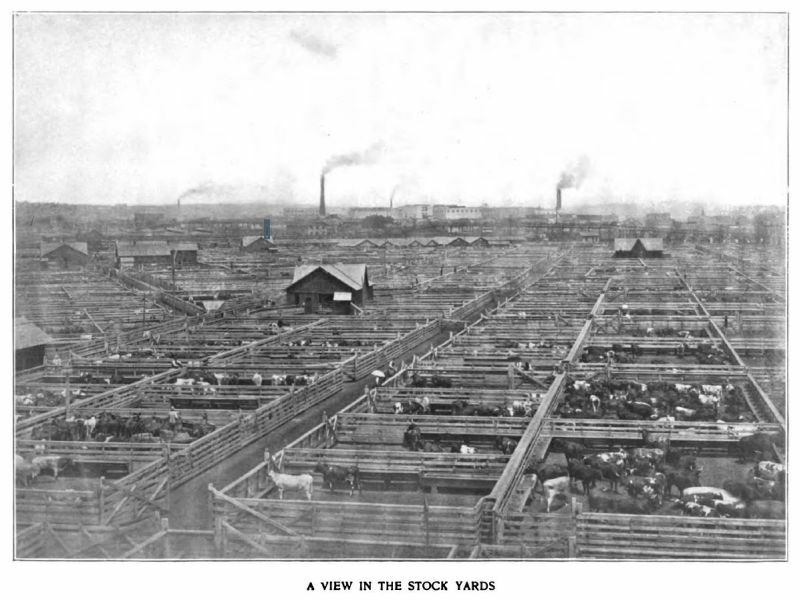 As these States and those further south and west are to a large extent engaged in the raising of live stock, Kansas City's greatest and most conspicuous industry is stock yards and their accompanying slaughtering and packing houses. Kansas City now ranks second only to Chicago in the volume of business in this line, and with the growing advantages of transportation of meat in refrigerator cars, as compared with the transporation "on the hoof," expects soon to rank well ahead of Chicago. It may be well to remark here that, in common with other Western cities, Kansas City's expectations are very great. Enthusiastic local patriotism, the outcome of rapid growth and development, is a strong characteristic of her citizens, all of whom are more of less imbued with the idea that "Kansas City has the brightest and most glorious futhere of any city on earth. The most noticeable feature of the city from a street railway point of view is its extremely irregular profile. Along the bank of the river are low bottom lands, which are frequently flooded at times of extreme high water. The greater part of the city is located on high bluffs, the elevation of which averages about 150 ft. above the low lands. The whole area occupied by the city was originally a series of sharp hills and deep gulleys, cut by rushing brooks through the clay soil down to the limestone substratum. These have requied extensive cutting and filling to get serviceable real estate, and in spite of this cutting and filling the city remains a series of hills and valleys, both north and south and east and west. 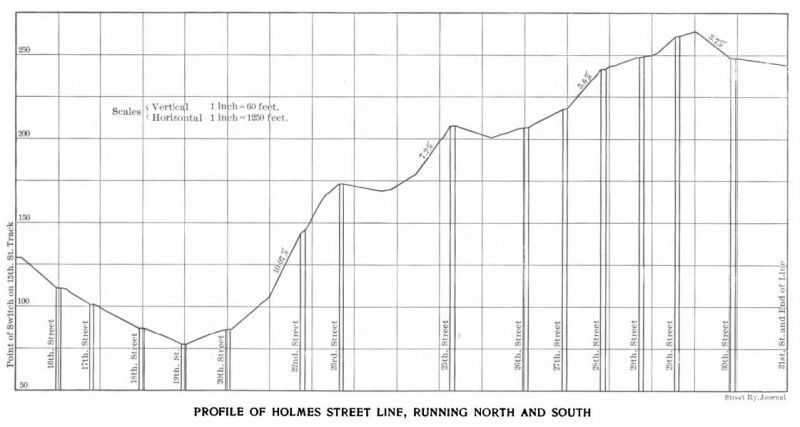 An idea of the inclinations of the present streets can be obtained from the profiles of several of the street railway lines given on one of the following pages. The Eighth and Ninth Streets lines run east and west, while the Holmes Street line runs north and south. The whole city lies south of the Missouri River, there being no opportunity for growth on the other side owing to the great width there of bottom lands, which are so frequently flooded as to render them uninhabitable. The river sweeps around a curve in front of the city, as is shown in the map, and threatens to cut across the low lands at any time and short-circuit this curve, leaving the city inland. Through Kansas City, Kan., there flows the Kansas or Kaw River, which must be crossed at several points to give access to the greater part of the Kansas portion of the city. No street railway lines whatever cross the Missouri, there being no population on the north side of the river. In the low lands lying along the Kaw River, near its junction with the Missouri, is the Union Depot district, containing the depot into which run almost all of the twenty-five railroads centralizing in Kansas City as well as the stock yards with a large number of their employees. The district also contains many large jobbing houses, handling agricultural implements and other wares. To reach the business center from this low district or from Kansas City, Kan., which is west of it, it is necessary to surmount a high ridge, which is clearly indicated in the profile of the Ninth Street line. On the other side of this ridge is a hollow or valley, through which run some of the principal streets, and from which it is again necessary to rise to reach the residence section of the city. 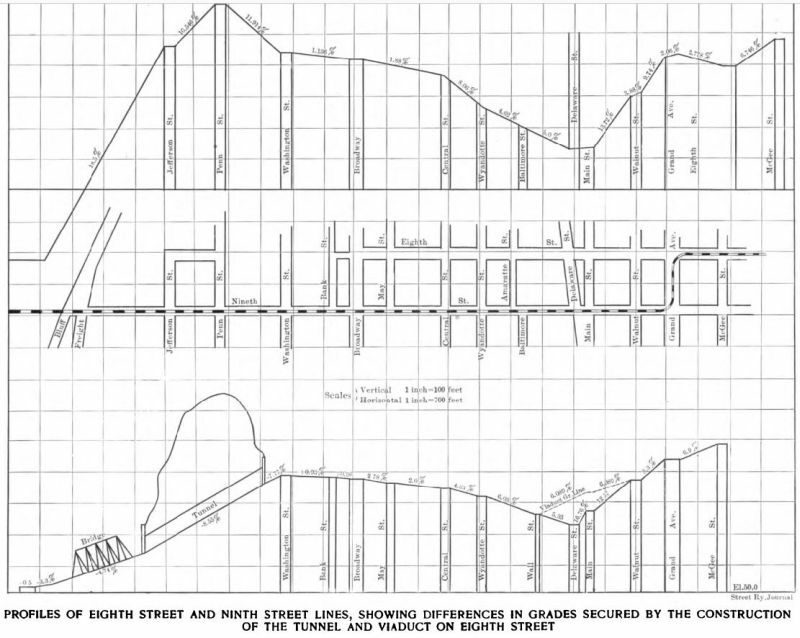 It is interesting to compare this profile of the Ninth Street line with that of another line also running to the Union Depot, but being elevated in the low lands and tunneling under the high ridge between the low lands and the depression, in which lies the business center. This line, with its lower grades, is that on Eighth Street, the profile of which is shown below that of Ninth Street. 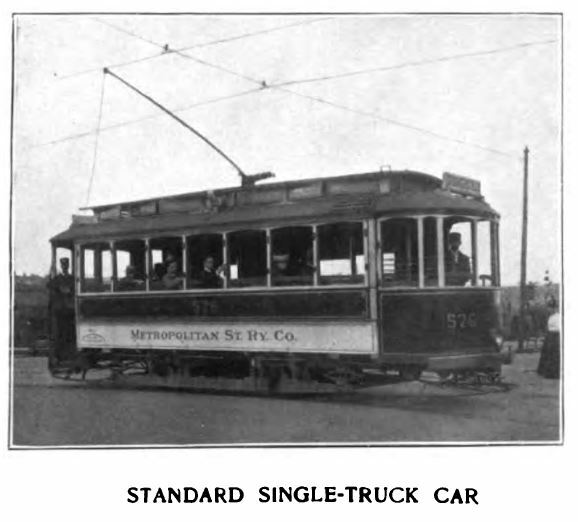 On account of these heavy grades the street railways in Kansas City have been largely operated on the cable system, although these cables are now being displaced by electric motors on all of the lines but two, the Ninth and Twelfth Street, on which the grades are so severe that cables are necessarily maintained. In fact Kansas City was for a long time the stronghold of the cable system in this country, ranking with San Francisco in point of mileage operated in this way. Before any lines were changed from cable to the electric system there were 63 miles of track operated by cables. Originally Kansas City was simply the river port town of Westport, now one of its residential districts. The real growth of Kansas City began about 1870; at that time Leavenworth, 25 miles further north on the Missouri River, was then the important river town, but as the latter place did not offer sufficient inducements to several railways building toward the Missouri River, they turned to the site of Kansas City as the crossing point. In earlier years the Missouri River traffic was an important element of the city's commerce, but the improvements of rail transportation have reduced this to a small factor. Some views of the early period of the city's history are given on a preceding page. The middle view is of the first street car operated; the left and right hand views, the homes of Jesse James, father and son. The growth since that time has been remarkably rapid, subject only to the usual ups and downs of good and bad times in the West. In 1885 and 1886 the city underwent a phenomenally vigorous "boom." It was then jocularly said of Kansas City that it was advisable to build residences on wheels in order that they might be easily moved from time to time out of the way of the advancing business section. In 1893 and following years the industrial depression generally felt throughout this country, and especially in the West, fell particularly heavy upon Kansas City, but the improved industrial conditions of the last few years with the good crops raised in the territory tributary to Kansas City have brought a revival of good times and a renewed but more healthy growth. The first horse car line in the city was started in 1871 between Kansas City and Westport, by Nehemiah Holmes, father of the Holmes brothers, now respectively president and general manager of the Metropolitan Street Railway Company. In order to convert this into a cable line and to build other lines, the Grand Avenue Cable Railway Company was incorporated on March 27, 1886. Another system of mule car lines was started in 1874 by a man familiarly known in Kansas City as Tom Corrigan. Five or six lines were built and operated frugally and shrewdly. The cable line built up Ninth Street by the Kansas City Cable Railway Company demonstrated the advantage of the cable over the horse system, but the Corrigan interests were unable to finance a change as expensive as the installation of cables, and in 1886 the Metropolitan Street Railway Company was organized to take over the system of the Corrigan Consolidated Street Railway Company and convert it into a cable system. The horse car lines were most antiquated in equipment, but were sold for $1,000,000 in 5 per cent first mortgage bonds. 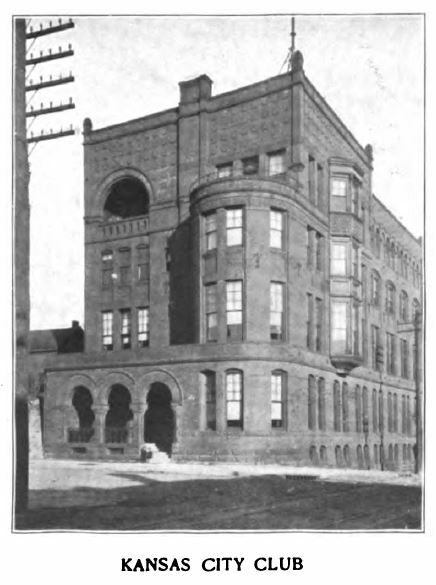 The Metropolitan Company has gradually absorbed nearly all of the other street railway properties in the two Kansas Cities, having taken over the elevated railway in 1894, the Kansas City Cable Railway and Grand Avenue Cable Railway and others in 1895, and others since. The only line in Kansas City which is does not control is the East Side Electric Railway, running along the low lands near the river, and built by a brewing establishment, more to reach their brewery than for any other purpose. In addition to this there is an interurban line, the Kansas City-Leavenworth Line, which is not associated with the Metropolitan system. Otherwise, the twenty lines in the city, with an aggregate length of 160 miles of track, are all operated by the Metropolitan Street Railway Company. Kansas City is laid out, as a reference to the map will show, on what is generally known as the Philadelphia system. The intersecting streets are, as a rule, at right angles to each other, and at regular distances apart. All streets running east and west are numbered, beginning at the river, and one hundred numbers are assigned to the buildings in each square; the streets running north and south are named and not numbered. The principal business streets in the city are: Main, Walnut and Grand Avenue. The greater part of the traffic of the Metropolitan Street Railway system converges at the post office corner, Walnut and Ninth Streets, where a constant succession of loaded cable trains comes up the 15 per cent grade from the direction of Union Depot, or descends the same grade toward the depot, these cars transferring a large number of their passengers to and from the lines running north and south on Walnut Street. Transfers are given generally on the Metropolitan system at about eighty-five points of intersection, so that any part of the city can be reached from any other part for a single fare. The company is now using about 70.000 transfers per day. that is about 25,000.000 annually, about half of its passenger receipts being represented by transfers. Practically all traffic to Kansas City, Kan., goes down past the Union Depot, either on the elevated road or on the surface electric line, which runs under it in the low lands and swings around the hills by a rather circuitous route to the business center. The elevated line was originally operated by steam locomotives. The grade of 8 1/2 per cent up through the tunnel was overcome by a grip car, which took the trailers from the steam locomotives. At present, this grade is easily surmounted by the electric cars, as the rails in the tunnel are always dry. 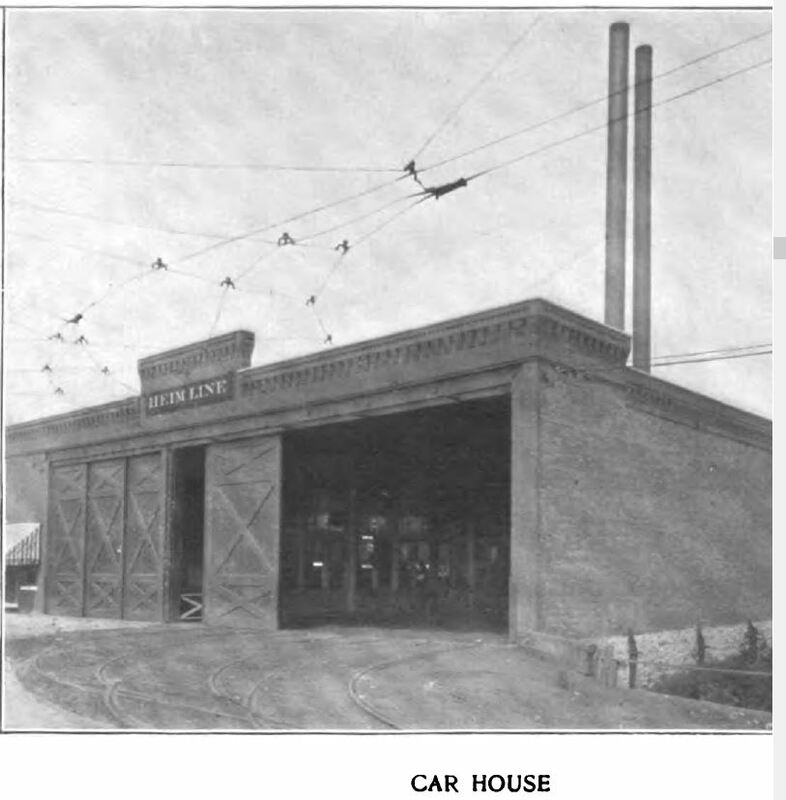 Before the present year the electric cars coming up from the elevated through the tunnel were unable to reach the main business section on Walnut Street and Grand Avenue and the district east of it. To overcome this difficulty a viaduct has been built in Eighth Street, bridging the valley through which run Delware and Main Streets, as illustrated in the profile already referred to. 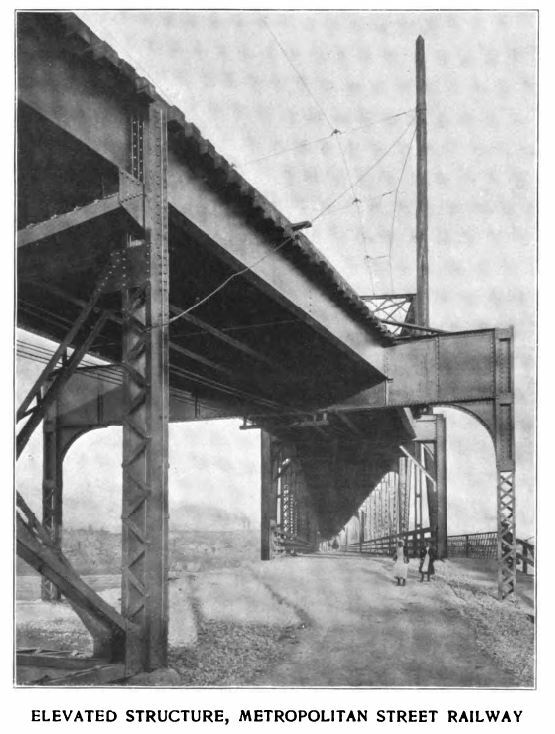 By means of this viaduct, the tunnel and the elevated over the low lands, this route presents a much more level profile than is presented by the Ninth Street line, which closely follows the surface, and is subject to such heavy ups and downs that electric cars cannot be run on it. Toward the southern and eastern directions from the business center the company's cable and electric lines form a regular gridiron through the residence districts, the grades being less severe in this part of the city, so that cable or even electric lines can be operated with no difficulty. As noted above, the twenty lines of the Metropolitan system have an aggregate length of about 160 miles, of which about 120 miles are operated electrically, the remaining 40 miles being cable driven. About 23 miles of lines formerly cable driven had been, previous to the present year, changed over to the electric system, and during last summer more of the remaining 40 miles of cable road were being prepared for the change. Several new lines, with an aggregate length of about 15 miles, are also under construction at the present time. In the eastern end of the city there is a road about 9 miles long, running from a depot at Fifteenth and Askew Avenue, out across the Blue River, past Washington Park, to the suburb of Independence, with a spur to Fairmount Park. This road runs largely on a private right of way, and was originally a steam line, operated by the Kansas City & Independence Railway Company. 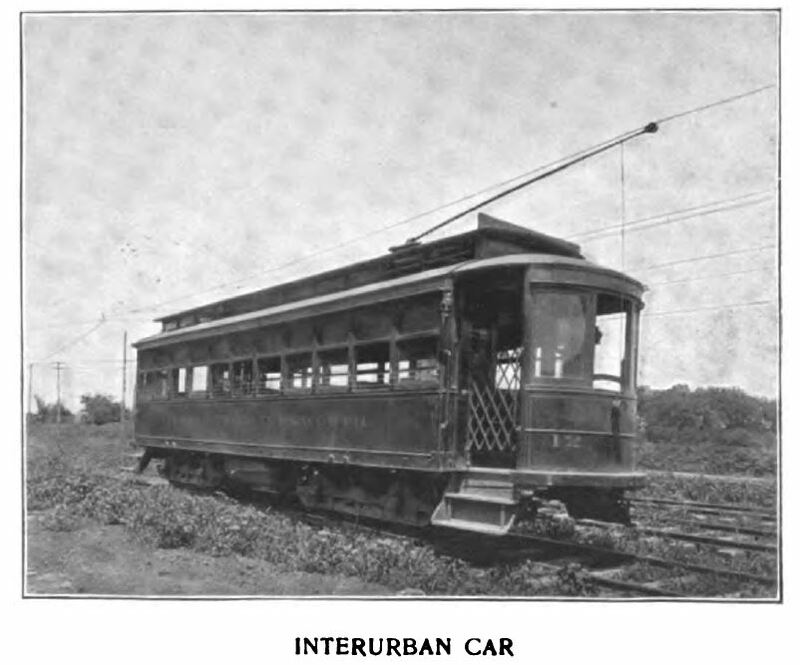 It was purchased by the Metropolitan Street Railway Company in 1895, and is now operated electrically to accommodate the suburban traffic to and from Independence, a place of about 12,000 inhabitants, and to carry passengers to and from Fairmount Park -- which is operated by the Fairmount Amusement Company, a corporation closely associated with the street railway company. The park, which was originally laid out by a steam railroad, covers about 250 acres, and is located about 10 miles from the center of the city. The Independence line get its traffic from the Fifteenth Street line, from which it starts, and also from the Twelfth Street and Ninth Street cable lines, which it intersects. The rates charged are 15 cents for the round trip from the depot to the park, without transfers, making the total cost per round trip from any other part of the city 25 cents. Thirty-minute service is given regularly, with greater frequency on Sundays and holidays. Some twenty-five to twenty-eight 45-ft. cars of the type illustrated herewith are run to Fairmount Park, five more cars being in continuous operation to Independence. These cars are driven by G. E. 1200 or G. E. 57 motors, two per car. The park is equipped with the usual attractions -- summer theater, boat house, bathing facilities, etc., which are leased by the Fairmount Amusement Company. Another park also reached by this street railway system is Troost Park, which lies on the Vine Street line, and near the Troost Avenue line. This park is leased by the Kansas City Park Diversion Company, which is closely associated with the street railway company. The park, which is located about 3 miles from the center of the city, covers about forty acres. Music is furnished by an orchestra, and on account of the convenience and low cost of access to this park large crowds attend it on good days, requiring at times from forty to fifty cable trains to handle them. 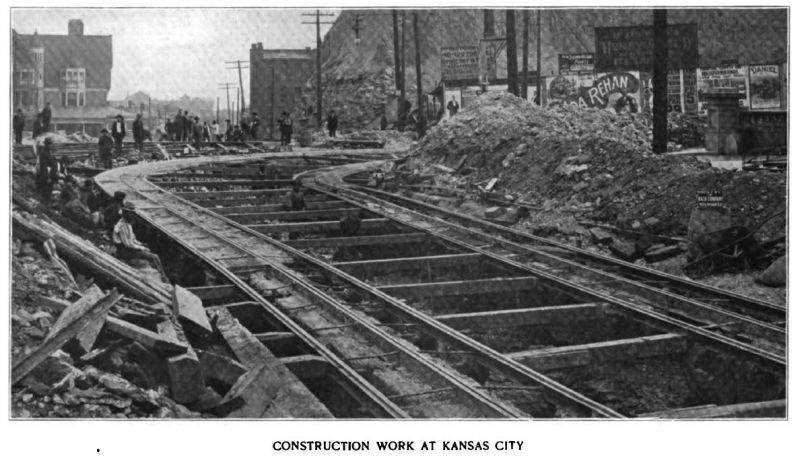 Practically all of the tracks in Kansas City are laid with center-bearing rails -- with the ball of the rail above the street level -- the companies never having been compelledd by city ordinance to use side-bearing rails. Some sidebearing rails have been put in, but have given trouble through tipping outward. All tracks recently laid are 103lb. 60-ft. center-bearing girder rails, made by the Lorain Steel Company. 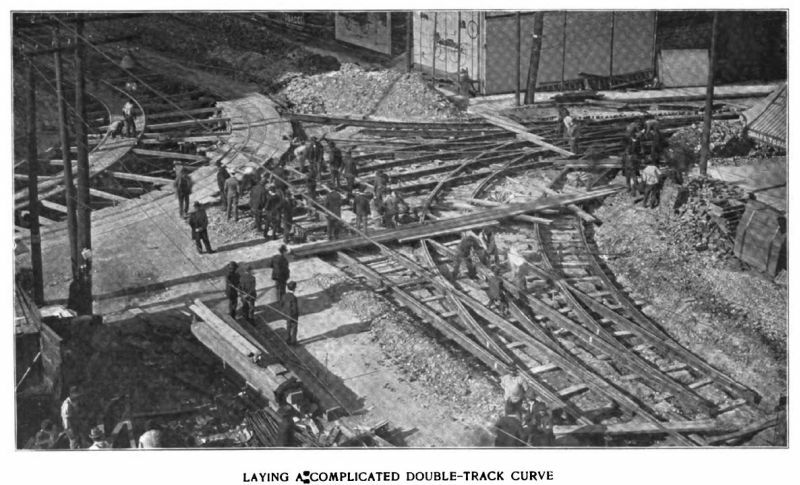 In the asphalted streets of the downtown district the construction described by Mr. Butts at the Chicago convention, and illustrated on page 795 of the Street Railway Journal for November, 1899, is used; the rails being held to gage (sic - JT) by the non-movable character of the street paving. Where the street is not asphalted outside of the tracks tie-rods are used to hold the rails to gage. It is claimed that this bedding of the rail in concrete considerably reduces the leakage of current from the rail to ground, and hence reduces danger of electrolysis of rails and underground piping. The construction is a simple one, a trench of the proper size for the concrete stringer being dug for each rail. The rail is then supported temporarily on wooden blocks, and the trench is filled with concrete, which is tamped tight about and under the rail. The rails are toothed on both sides with granite blocks to protect the pavement from wear. The company is obliged to pave between its rails and between its tracks, but is not obliged to pave any part of the street outside of its tracks. Brick paving is used between the tracks to a considerable extent, and in some cases between the rails, but at the latter place trouble is occasionally caused by frost raising the brick paving until it strikes the motors. All the cable lines are paved with stone. 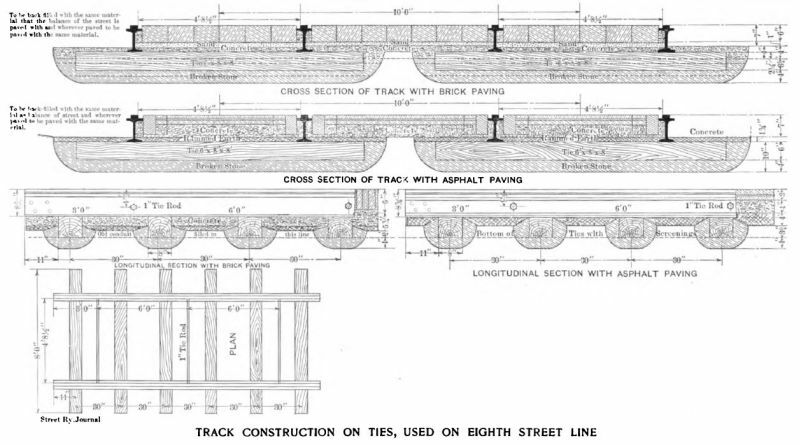 Where the concrete stringer construction described above is not used the various forms of track construction on wooden ties shown in the cut are made use of according to whether the pavement is of brick or asphalt. The joints throughout the entire system are to a large extent cast-welded, this work having been done by the Falk Company, which has also laid a large amount of track, and particularly of elaborate special work for the Metropolitan Street Railway Company during the last two or three years. 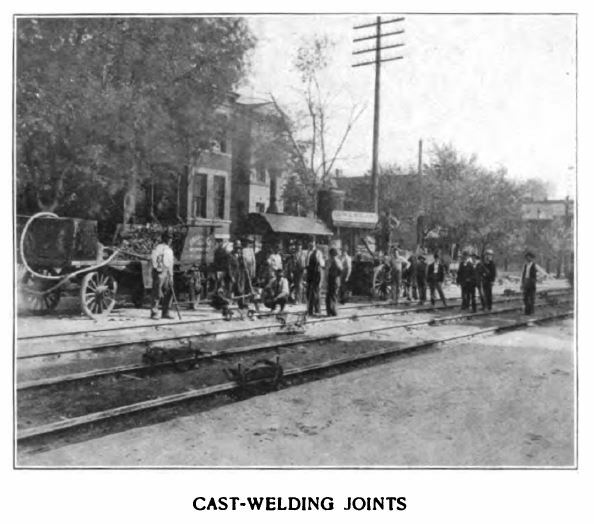 Not only are the tracks of the electric lines and the cable lines, which have been converted into electric service, cast-welded, but cast-welds have also been put in on some of the cable lines where, of course, their electrical conductivity is of no value, the sole purpose being to preserve the joints. Cast-welds are not used on special work, which is all carefully bonded up to reduce the resistance of the return circuit. The North American Railway Construction Company has also done a large amount of cast welding and special work installing. The cast-welded joints have been found very satisfactory on the 6-in. and 9-in. sizes of rails, but have not been found satisfactory, owing to breakages, on the lighter 4 1/2-in. rails. In re-equipping some of the cable lines for electric cars the tie-rods holding the slot rails from closing have been cut, thus allowing the pavement to force the slot rails together and close the slot. It was found, however, that the slot rails do not always come together at the same level, one slipping under the other in some places, giving a bad surface. In the re-equipment of other lines the slots have been closed by filling the whole conduit with rock dust; this gradually settles and must be refilled several times, after which it leaves a firm foundation for paving in case at any time the slot rails are removed and the tracks repaved. The company owns about 800 cars, about half cable and half electric of various types, shown in the group of different scenes herwith. 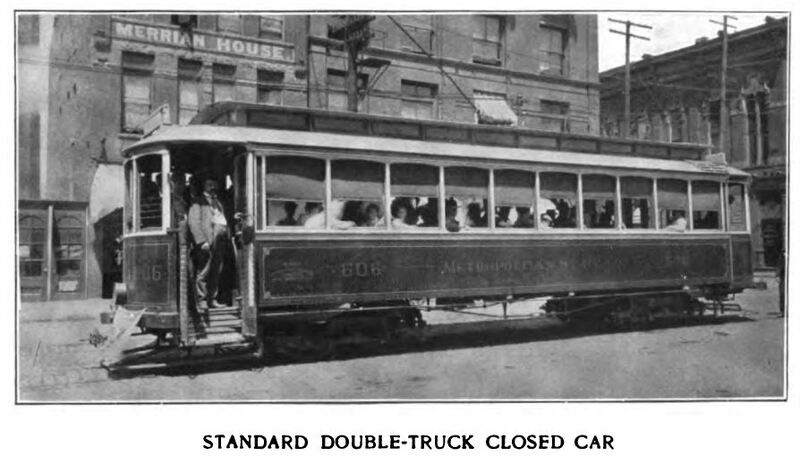 These cars were made by the Stephenson Company, Laclede Car Company, St. Louis Car Company, American Car Company and Brownell Car Company, are mounted on Peckham, Brill and Dupont trucks, and are equipped with General Electric motors. For the Westport line, which has an extremely long, heaby grade, the company recently ordered double-truck cars, each equipped with four G. E. 57 motors and with the Christensen air brake system, with independent motor-driven air pump. To avoid accidents the running-boards have been taken off from the sides of open cars as far as possible, and an aisle has been cut through the center to give access to and from the platforms at a sacrifice of considerable living space. The electric cars, almost all of which are close, are provided with gates operated from the opposite platform, so that no one can enter or leave the car until the motorman opens the gate on the rear platform, or after he closes it. While this causes some loss of time the reduction of the accident account is a great advantage. For each of these cars the company is obliged to pay a license fee of $30 per year in Kansas City, Kan. as well as in Kansas City, Mo. Cars operating in both are obliged to have separate licenses for both, even in the case of those that simply cross the State line for a block or two at the end of their route. The road is obliged to put up in each car a separate license. Some 600 of these are taken out at the beginning of the year, and paid for at the rate of $20 apiece. At the end of the year the average daily run, on an eighteen-hour basis, is figured up and the cities are paid a sufficient amount over and above that paid for the original licenses to cover the average number of cars run at $30 per year. The total car hours per year on the system figure up equivalent to about 300 cars, eighteen hours, 365 days. The methods used by the electrical department of the Metropolitan Street Railway for furnishing specifications for overhead lines and for keeping track of work already put in have some features differing from the practice of other roads, and will be of interest. This work is under the charge of Charles Graver, who is chief electrician of the Metropolitan Street Railway Company. Before any new construction work is done specifications are prepared for the entire route with drawings, showing the location and spacing of all poles, guys, section insulators, etc. If bids are asked on the work these plans form part of the specifications, and at any event they are the plans which the linemen follow for the work. All poles are 6 ins., 7 ins., 8 ins., and 31 ft. long, unless specified otherwise by a letter, which letter corresponds to some other kind of pole, as given in the side notes. The distance between each pole is given directly on the plan of the route. 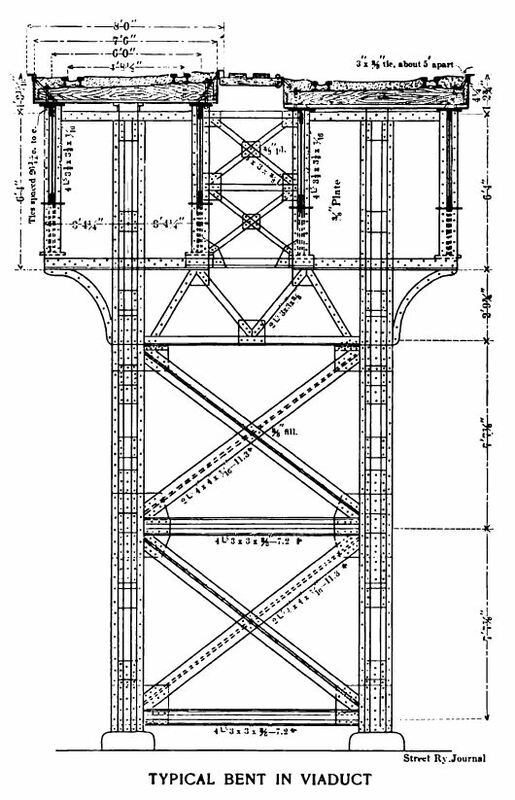 Blue prints of this kind for each section of the line are issued. One feature recently adopted is the drawing of a double circle for all poles not of the above dimensions, so that in glancing over the plans special poles are more easily distinguished. The feeders are indicated by a heavily dotted line on one side of the street and the distances on the other side. The explanations of all abbreviations used are to be found on one side of each blue print. The insulated bolts used on this road are the same for both the trolley hangers and strain insulators, and are all interchangeable, so that only one kind is kept in stock. The copper data for the system, that is the location, length and size of conducting lines, both trolley and feed, are kept on another set of blue prints. These are in no sense maps, no attention being paid either to scale or direction, but the lines are indicated with notations, which refer to points on a large city map with which the different points on the sheet can be located. This avoids the necessity of elaborate care in drawing, with the accompanying expense, while it secures equally as exact results as a drawing to scale. An electric locomotive is in use on the Independence line for hauling coal to the power station and for construction work. This locomotive was built in the Metropolitan shops, and has a number of features of interest, most prominent among which are the controllers, which are said to be the only ones in successful use to-day operating four motors in series, series-parallel or all in parallel without the use of any auxiliary commutating switch, and in the ordinary single revolution of the controller handle in acceleration. The four motors used are Edison No. 16, 30 hp. The controllers were designed by Charles Grover, the company's electrician, and were built in the shops. The motors are thrown four in series at first, then two in series, two in parallel and finally four in parallel. Four in parallel they run about 17 miles per hour. There are five series points, four series multiple points, and three multiple points. The controller is 44 3/8 ins. high, 22 1/2 ins. wide at the back, and 11 1/2 ins. deep. The cut-out switches throw the motors in multiple when one motor is cut out, and the controller is then only operated on five points when one motor is out. One of the strong points about the controller is the efficient magnetic blow-out. This is so strong in its action that it is not necessary to throw the controller entirely off before going from a higher point to a lower one, as there is little danger of starting an arc when passing from parallel to series. The blow-outs consist of small, flat coils, located in the vulcanized fibre guards between the rings. These coils are made of a few turns of flat copper strip, wound in a 1-in. iron core. The axis of each coil is parallel to the controller shaft. This controller by its series combinations permits the hauling of heavy loads slowly with very little current, and at the same time good speeds can be made if desired. 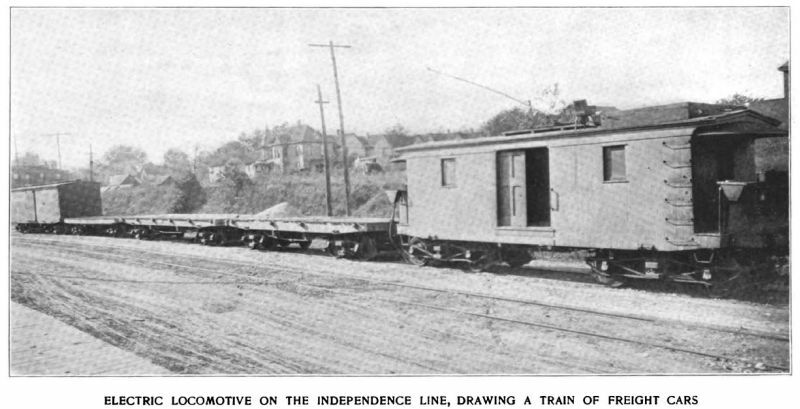 The locomotive, which is shown in the accompanying engraving, is hitched to standard steam cars, and hauls them wherever they may be needed for fuel or ballast on the Independence line. It is not uncommon for it to haul three loaded coal cars. It weighs 20 tons, is 34 ft. long over platforms, has 40-in. platforms, and the wheel base of each truck is 7 ft. 4 ins. It is used as a tower car, and inside the car is a tower that can be raised with a windlass. The company has found it very convenient in its construction work. For running the various cable lines there are several cable-driving stations scattered throughout the city. Some of these contain small electric generators, but practically all of the power for the electric lines is generated in the Kaw River power station in Kansas City, Kan. This station contains engines with an aggregate rated capacity of nearly 7000 hp, and is fitted with all the latest improvements, making it one of the most economical stations in the country, power being turned out at a cost of less than one-half cent per kw-hour. The building is a brick structure, with steel framework. The engine room is 144 ft. long and 63 ft. wide; the boiler room is 144 ft. long by 51 ft. wide, and the height of both is 33 ft. 7 ins. from the top of the foundations to the underside of the bottom chords of the roof trusses. The boiler room contains both Babcock & Wilcox boilers, and Cahall boilers of the horizontal type, in batteries of 500 hp each. To these, four 500-hp boilers are soon to be added to bring the boiler capacity up to the power requirements of the engines. The boilers are fitted with B. & W and Green chain-grate stokers, which work very satisfactorily on the Cherokee slack, which is the fuel used in that part of the country, this fuel being mined a short distance south of Kansas City in Kansas. The steel stack of this station is 175 ft. high above the brick work. Coal is handled by means of a Hunt conveyor and cars into bins over the boiler room, with a capacity of 600 tons, from which bins it descends through chutes to the stokers. The engine room, a view of which appears on the first page, contains four Allis-Corliss horizontal engines of various sizes and cylinder arrangements, some being tandem and some cross-compound. Two of these are direct-coupled to Walker generators, and two others to General Electric machines. The last of these four units was put in during the present year, and deserves more than passing notice, as it is one of the largest railway machines in the country. The engine is rated at 2500 hp, the generator being rated at 1600 kw, with a 40 per cent overload capacity for three hours' time. This engine has independent Allis air and circulating pumps, in this particular case the two machines being independent of each other. The engine exhausts into a Wheeler condenser with an effective surface of 5000 sq. ft. The shaft of this engine is of the hollow-forged fluid-compressed steel type; the fly wheeel is 24 ft. in diameter, with a weight of 160,000 lbs. The switchboard of this station is double-decked, the feeder panels being put on the gallery. It is notable for the number of recording wattmeters in use, designed to give records of the amount of power used on the different lines, the lines being as a rule separately run on individual feeders, overhead copper not being cross-connected out on the lines. 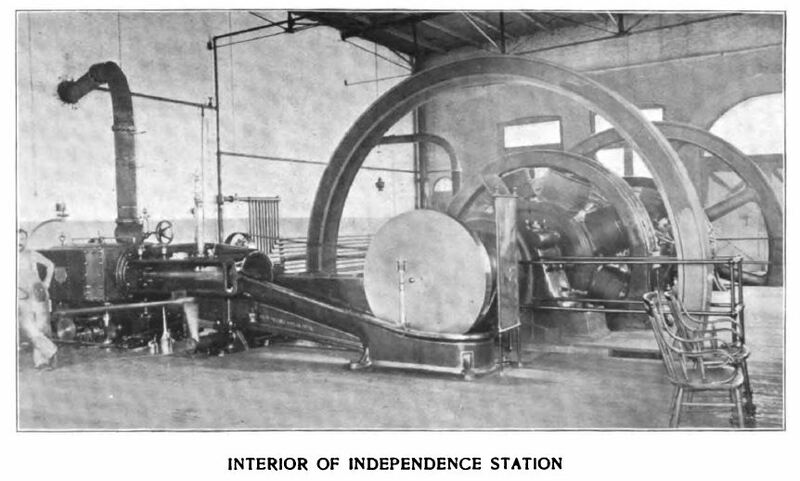 As this station supplies all of the electric lines with the exception of the Independence road, and as it is some distance from several of the roads on the Missouri side, a large amount of copper runs out from it, there being thirty feeders with a cross-section varying from 300,000 to 1,000,000 circ. mils. This station during the year 1899 turned out 5,608,000 kw-hours, burning 13,616 tons of coal, or 4.68 lbs. of coal per kw-hour. The coal burned is usually Cherokee slack. 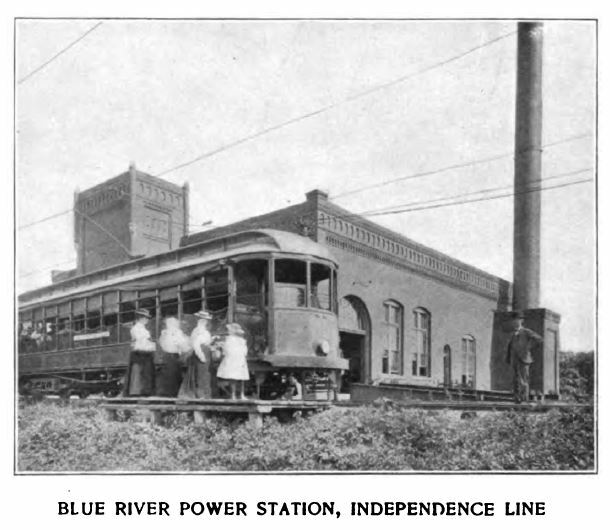 The only electric power station outside of the Kaw River station is a comparatively small one on the Blue River at a point where the line to Fairmount Park and Independence crosses, this station running the Fairmount Park & Independence line only. This station contains a 250-kw and a 400-kw General Electric generator, direct-driven by simple, condensing Corliss engines. The boilers are of the horizontal tubular type, and manual stoking is used. An interesting detail of the power stations is the motor-driven cable station, in which a 300-kw T. H. four-pole generator is used as a motor to drive 24,000 ft. of cable. About ten to sixteen trains are on this cable at one time, the line having one 10 per cent grade. The motor input varies from 200 amps, to 600 amps., running up to 800 amps, on heavy days. The motor is compound-wound, half of the original series coils being used for this purpose, the two coils on two opposite poles being cut in, the two other coils being cut out. The motor is started with a water rheostat. Complete duplicate motors, cable drivers and cables are provided on this line. The cost of the cable system is considerable for renewals. The Ninth Street rope is 21,000 ft. long, and has to be renewed about every forty days, the ropes taken out from this line being used on more level and less heavily traveled routes, on which the cables will easily last from six to nine months. Before any of the cable lines were changed over to electric there were about 350,000 ft. of cable in use, which cost from $75,000 to $90,000 per year for ropes alone. The cable run at a speed of about 12 miles per hour, on some of the residential lines. The cable cars make a schedule of about 9 miles per hour, and the electric cars about 12 miles. the cable road, whose power is now derived from an electric motor taking current from the main electric power station, is the Summit Street line. This line has a length of a little over 4 miles, measured as single track, and was formerly operated by a 24-in. x 48-in. Wright automatic cut-off engine. The power from the motor is transmitted to the original cable machinery by a belt of 36 ins. wide, passing over a 34-in. pulley on the motor to a 24-ft. pulley on the cable machinery. The management of the company reports that the cable machinery has been operated more successfully and satisfactorily by the motor than it was by the engine, and with greatly reduced cost. The rates paid gripmen, motormen and conductors in Kansas City are as follows: The men on the cable lines are paid 17 cents per hour during the first year, 18 cents during the second year, 19 cents during the third, fourth and fifth vears, and 20 cents after that period of service. On the more important electric lines the men are paid just one cent less for the several different periods; on the smaller and less traveled electric lines 2 cents less. 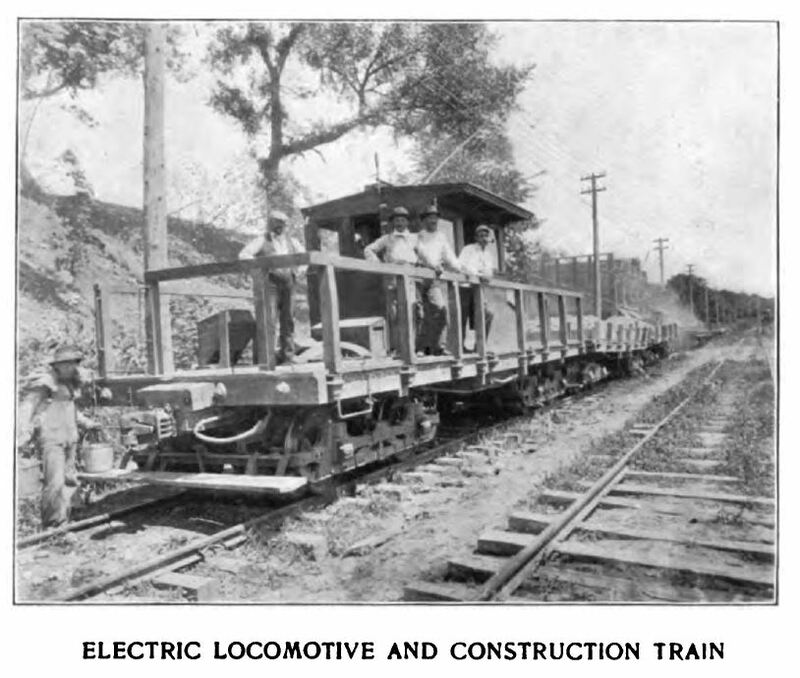 Owing to the operation by the company of two stations with dissimilar equipment the oppportunities for studying the economical production of electric railway power, under different conditions, are unusually good in Kansas City. The Kaw River, or Central Avenue station, has a national reputation as being one of the most economical in cost of power production of any in the country. The figues from this plant for the first seven months of 1900 show that the average total cost of power, exclusive of interest, taxes and insurance, was $.0041 per kw-hour for this period. The cost of coal runs about $1.20 per ton. The load was usually carried by two 1200-kw units, with a 550 kw to take the owl car load. At the present writing eleven men run the plant twenty-four hours. The figures from the Blue River station show that the average total cost of power, exclusive of interest, taxes and insurance, for the first seven months of 1900 was $.0079 per kw-hour. This is not quite double that of the Central Avenue station. At first thought this might be credited entirely to the labor-saving appliances in the Central Avenue station boiler room, but the difference is not entirely there; in fact the difference in fuel consumption per kw-hour in the two plants is almost as great in proportion as the difference in total power cost per kw-hour. The differences in the equipment of the two stations, which are accountable for the differences in cost of power, are as follows: Large as against small direct-connected units, compound-condensing as against simple condensing engines, water-tube as against tubular horizontal boilers, and mechanical as against manual stoking. The comparison is especially valuable because both stations are owned by the same company, and operated in the same manner. It is also of much interest as throwing light on a problem many electric railway engineers have to face these days, namely, whether the economies of a large station and large units, as compared to a number of smaller stations with smaller units, is sufficient to warrant putting in a polyphase high-tension distribution system. The Blue River plant is a well equipped and modern plant, as stations of that size run. The conclusion that must be reached after comparing the efficiencies of the two plants in dollars and cents is that there is considerably more difference between the economy of well equipped large and small stations than has heretofore been generally thought. 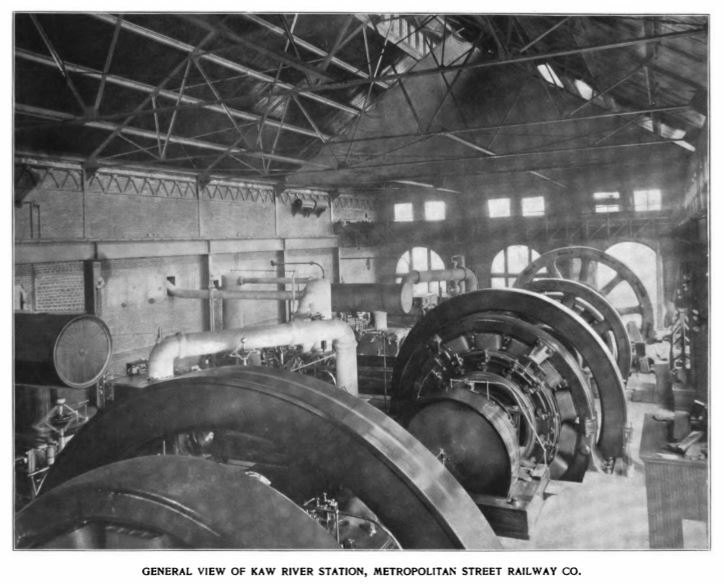 The object lesson in economical power generation furnished by the Central Avenue plant has been made good use of in Kansas City, as the Kansas City Electric Light Company, which is controlled by prominent stockholders in the Metropolitan Street Railway Company, will probably soon build a large central generating plant on some good river location, and distribute by polyphase high-tension currents to sub-stations. A similar plan has been talked of from time to time for the street railway, and it is not unlikely that it will ultimately be carried out for distribution to lines not economically supplied by the Central Avenue direct-current station. Charles Grover, chief electrician of the Metropolitan Street Railway, has given the matter of polyphase distribution considerable attention, and calculates that the Central Avenue station is now supplying a larger area than economy would justify if a polyphase distribution were in effect. He believes that the present limit of economical feeding direct from the power house is located on the east at about Grand Avenue, and that all east of that point could more profitably be fed in some other way. The present electric plants in cable power houses are, of course, not very economical, and what little they furnish to supply the trolley lines could better be furnished by sub-stations located in the same buildings. The ultimate solution of the power distribution problem in Kansas City will be watched with interest. The polyphase generating plant, when built, will be erected on the Blue River immediately adjacent to the site of the present power house at that point. It will contain several 25-cycle 6600-volt generators of 1500-kw or 2000-kw sizes; the details of this equipment not having been determined by the consulting engineers, Messrs. Pierce, Richardson & Neiler, at the time of writing this article. Two rotary-converter sub-stations for the traction system will be put in at the present cable stations of the railway company, one at Eighteenth and Olive Streets, and the other at Eighth and Woodland. These stations will lift off a large part of the Missouri load from the Kaw River station, cutting down greatly the amount of copper required for feeders, and, as described, will leave the Kaw River station to supply only loads on its own side of the city. The authorized capital stock of the Metropolitan Street Railway Company is $8,500,000, of which $5,586,000 is outstanding. The company has issued $5,100,000 in 5 per cent bonds, and has guaranteed about $7,500,000 of bonds of underlying companies. The gross earnings for the past four years are as follows: 1896-07, $1,774,892; 1897-98, $1,949,605; 1898-99, $2,094,378; 1899-1900, $2,353,267. The dividends have been 2 and 2 1/2 per cent annually until 1899, when 1 per cent quarterly was paid. This has been increased during the present year to 1 1/4 per cent quarterly, or 5 per cent annually. It is now proposed to reorganize the financial affairs of the company in such a way as to provide for the proposed changes mentioned above, and without detriment to the present stockholders. The heaviest owner of the Metropolitan Street Railway Company is P. D. Armour. The officers are: P. A. Valentine, chairman of the board of directors; W. H. Holmes, president; L. E. James, vice-president; C. F. Holmes, general manager; D. B. Holmes and Frank Hagerman, general counsel; W. A. Satterlee, general superintendent; D. W. Dozier, chief mechanical engineer; E. W. Butts, civil engineer; Charles Grover, electrical engineer; J.A. Harder, auditor, and J. W. G. Becker, master mechanic. The directors of the company are: C. F. Morse, Wallace Pratt, C. F. Adams, P. A. Valentine, W. H. Holmes, L. E. James, Norman B. Ream and C. F. Holmes. The only street railway line entirely in Kansas City and independent of the Metropolitan system, is that of the East Side Electric Railway Company, popularly known as the Heim line. The road was built by three brothers, familiarly known in Kansas City as Joe, Ferd and Mike Heim, the owners of a large brewery, to reach which was the primary object of building the line. The Heim brothers wished the Metropolitan company to build the line, but as the latter did not consider it a profitable extension, the brothers built it themselves. The line is 3 miles long, double track, and runs from the Market Square in a direction generally eastward along the low lands near the Missouri River. Extensions are now definitely planned which will make the line 7 miles in length, and further extensions are being considered for the future. The company has issued no bonds, and no stock to anyone outside of the owners mentioned above. The line is operated under a franchise running until 1925, calling for free transfers to the Metropolitan system, and requiring the same car license that is paid by that system, viz., $30 per car per year. The construction of the line was commenced on June 22, 1899, and the cars were first run on Nov. 27. The track consists of Johnson 82-lb. rails, laid on ties 27 ins. between centers, bedded in concrete, which fills the space between and over the ties and over the foot of the rail. The joints were cast-welded by the Falk Company. The line owns fourteen cars, of which about ten are in use regularly. Six of these are very handsome, and are 40 ft. in length, with cross seats and smoking compartments. They were built by the St. Louis Car Company, and are driven by Westinghouse No. 49 motors, two per car. The remainder of the rolling stock is made up of single-truck open cars, designed for the heavy traffic to the park. The power house of this line contains one unusually handsome and smooth working unit, consisting of a Siemens & Halske 200-kw generator, direct-coupled to a St. Louis-Corliss engine, running at 100 r. p. m. In addition there are two D 62s and two 110-volt lighting machines for illuminating the park. The 500-volt switchboard of the power house consists of an old T.-H. board, which has been remodeled, with back connections and instrument cases. 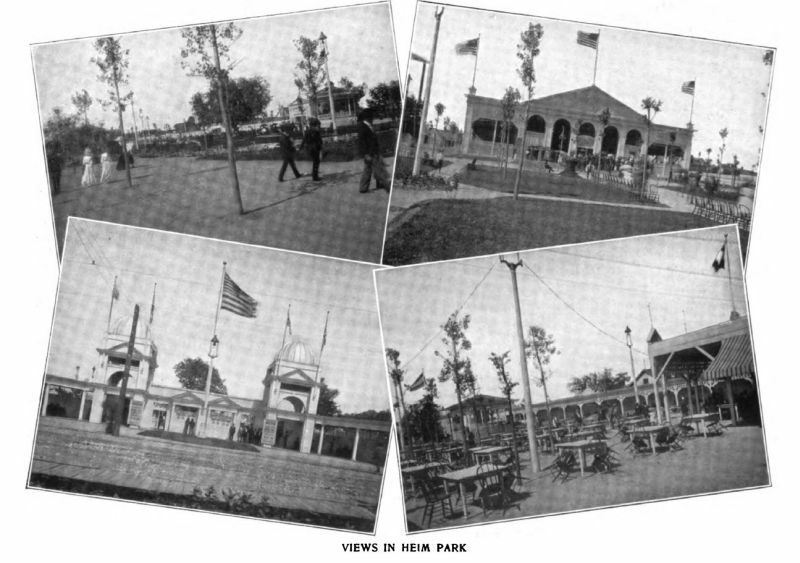 The park of this line, covering about twelve acres, is Kansas City's greatest summer-night attraction and vaudeville-entertainment resort. The theater, 140 ft. x 110 ft., with latticed walls, through which the breezes can blow, has a seating capacity for 3000 people, and a stage completely equipped with all desirable appliances for the vaudeville entertainments which are given with frequent change of bill, the theater being what is known in that part of the country as an Orpheum Circuit. 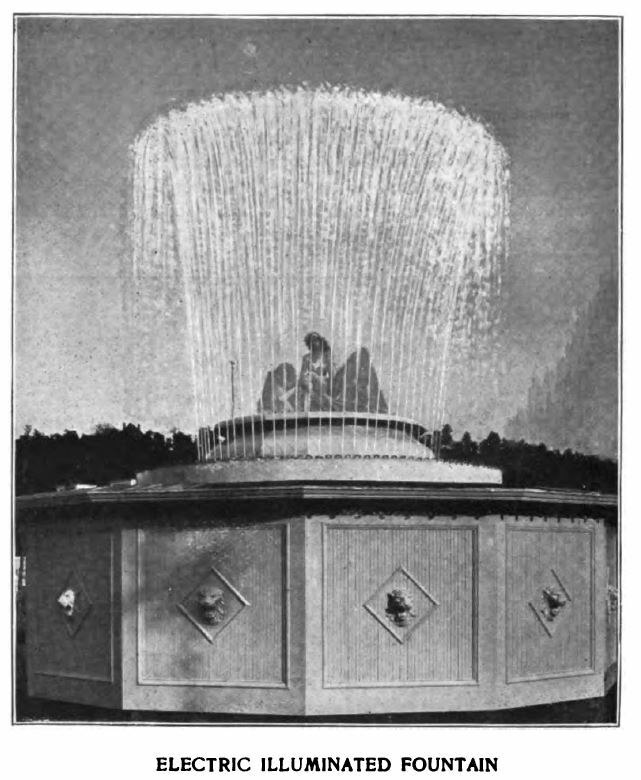 Undoubtedly the greatest attraction of the park is the electrical spectacular fountain, built by C. A. Dunlap, of Providence, R. I., and equipped with the unique features of Dunlap fountains. These features are tableaus, dances, living pictures, etc., surrounded by a wall of jets of water. The characters taking part in the dances or other scenes are brought up from the base of the fountain to the field of view by means of an elevator with a glass platform, through which they may be illuminated by projectors from below. The jets forming the wall of spray about this little stage are all inclined outward, so that no water need strike the dancers. With the many possible changes of the figures produced by the jets and of the colors thrown into the water from below, as well as from projectors located in an operating cabin outside of the little pond around the fountain, the spectacle is an unusually beautiful one. The evening's display of this fountain is ended by sending up a fireworks frame on the elevator, the exploding fireworks being surrounded by a wall of illuminated spray. 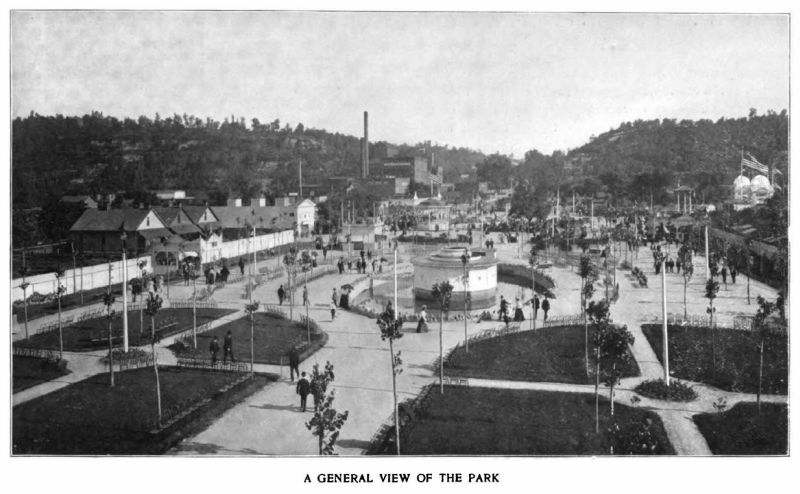 The park has the other usual features of resorts of this class, including a cinematograph, a band stand, bowling alleys, a billiard hall, etc. The whole is brilliantly lighted by current from the neighboring power plant of the line, 500 volts being used for the outdoor lighting and 110 volts for the theater lighting. A large number of Adams-Bagnall enclosed arc lamps are used, supplemented with incandescent lamps to trace out the architectural features of the buildings, and to illuminate some handsome shade trees, making them resemble by night enormous Christmas trees. An admission of 10 cents is charged to the park, seats in the theater costing 10, 20 and 30 cents extra. The president of the East Side Electric Railway Company is J. J. Heim. The management and operation of the road are entirely in the hands of W. O. Hands, who constitutes the entire staff of active officers of this small line. 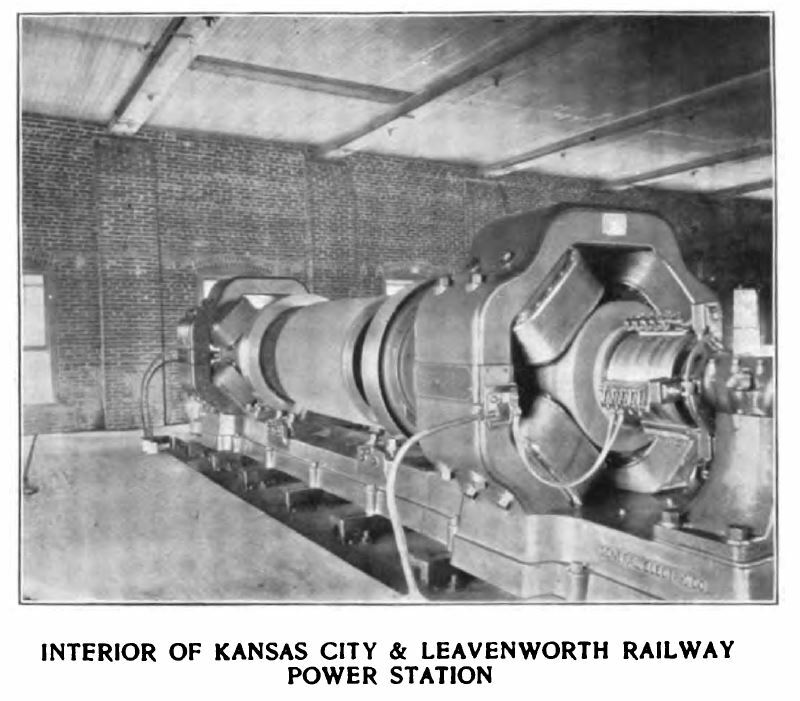 The only interurban line running out of Kansas City is that of the Kansas City-Leavenworth Electric Railway Company, which runs in a direction generally northward and parallel with the Missouri River to the city of Leavenworth, Kan. This place, which has a population of 25,000 inhabitants, is 26 miles from Kansas City. The district through which the road runs is a highly cultivated farming country with no intermediate towns of importance with the exception of one named Wolcott, in honor of some of the gentlemen associated with the road, at which place are located the power station, car houses, shops, offices, etc., of the line. The road has been in operation but a short time; its construction was commenced in April, 1899, and regular service was started in January of this year. The line is single track, runs almost entirely on its own right of way, and its rails and special work are of standard steam railroad form, so that the wide tread and deep flange of steam railroad wheels can be used, making possible unusually high-speed service. 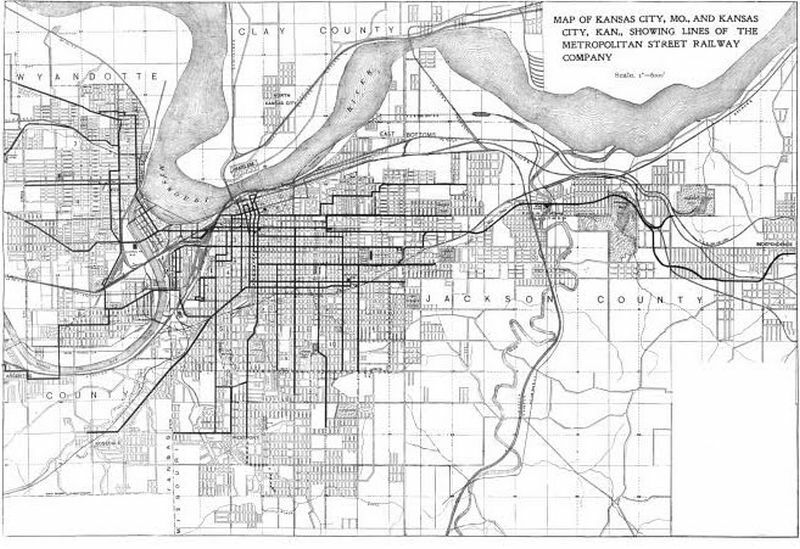 The road at present starts from Grand View, a point in Kansas City, Kan., about 3 miles from the business center, reached by one of the branches from the elevated line of the Metropolitan Street Railway Company, but the interurban line has obtained a franchise to run down further into Kansas City, Kan., nearer the center of the city. In Leavenworth the road is associated with the local street railway company, and runs over its lines to the center of the city. The road winds in and out among the hills with many curves, but is, as a rule, fairly level, although there are some 4 or 5 per cent grades. The track construction consists of Johnson 61-lb. T-rails, on selected white oak ties, laid 2 ft. between centers on rock ballast 12 ins. deep. 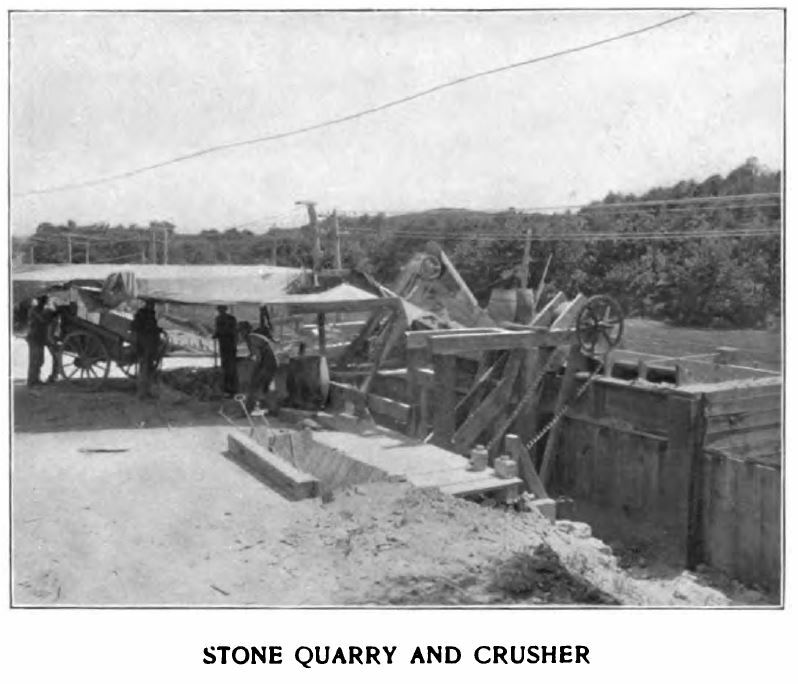 The company has its own motor-driven rock crusher, shown in one cut, for preparing its ballast. Spring switches and frogs are used in the turnouts, so that the cars can run through them at high speed. The rails are fastened together with American rail-joints, covering Atkinson protected bonds. Two OOO Fig. 8 trolley wires are used, suspended from brackets. Practically the whole line is supplied with power from one generating station at Wolcott, Kan., about 12 miles from either end. 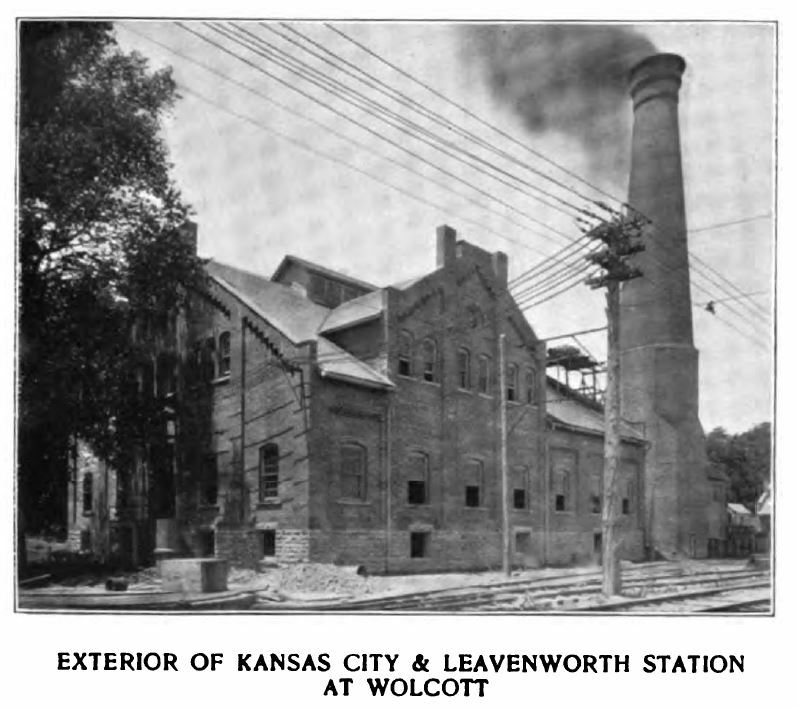 At Leavenworth the line is electrically connected with the power house of the Leavenworth system, but the Wolcott station, 12 miles away, feeds the Leavenworth lines more than the Leavenworth power house feeds the interurban line. On account of the long distances over which current is distributed a large cross section of feeders is necessary. These are of bare aluminum, with a cross section of 362,000 circ. mils. Nine of these feeders run out from the power house for various distances along the line, six in one direction and three in the other. Through service from Kansas City to Leavenworth is given every hour on week days and every half hour on Sundays, the schedule time of covering the 25 miles between the two cities, with about fifteen regular stops, being one hour and fifteen minutes; this requires three cars on week days and six to eight on Sundays. The rates charged are 50 cents between the two cities in one direction, and 75 cents for the round trip, with local fares in proportion. A lower rate is made to inmates of the Soldiers' Home, near which the line passes, as well as to clergymen, sisters of charity and members of the Salvation Army. A newsboy distributes ice water and sells fruit and other commodities in the cars after the fashion common on steam railroad trains. There is considerable competition with the steam railroads, of which four run between Kansas City and Leavenworth, the Missouri Pacific Railway being the most active competitor, with seven trains each way per day, making the run in about fifty minutes, and charging $1 per round trip. The ten cars constituting the rolling stock of this line -- made by the American Car Company -- are of the style shown below. They are 41 ft. long, with an unusually wide body, about 9 ft. over all, giving ample room for cross seats. All have smoking compartments, and some of them have baggage rooms. The weight is 22 tons each. They are driven by Steel 50-hp motors, four per car, geared up to a speed of 45 miles per hour. The motors are controlled by one Steel No. 44 controller per car, the cars being single-ended, and running around a Y at each end of the route. The cars are equipped with the Magann storage air-brake system, which is remarkably successful, considering the length of the run and the consequent length of time between re-charges. The air is compressed in the power station at the middle of the line by an Ingersoll-Sergeant air compressor to a pressure of 300 lbs. per square inch, and the storage tanks on each car have sufficient volume to carry the car two complete round trips, aggregating 100 miles. The air passes through a reducing valve before reaching the brake cylinders, so that it is impossible to apply full storage-tank pressure to the cylinders. This valve is set to give 45 lbs. per square inch. The company also operates an electric locomotive with the same equipment of four 50-hp motors, geared down to 20 miles per hour. This locomotive hauls coal and ballast, and handles the work train. On holidays the road gets a rush of pleasure traffic, owing to the agreeable nature of the ride upon it over the picturesque rolling and farming country through which it runs. This heavy traffic is handled by means of some cattle cars which the company has converted to passenger uses, these cars being drawn by the electric locomotive. A park is to be built on several hundred acres of land owned by the company at Wolcott to accommodate and attract more of this excursion traffic. The company also owns a steam locomotive, which was used for construction work, and which appears in the accompanying illustration. The power station at Wolcott is the substantial-appearing brick building shown herewith. A noticeable feature of the exterior of the station is the stocky chimney, which is unusually large in girth and heavily tapered for its height of 140 ft., so as to resist the high winds and cyclones common in this part of the country. The station contains four Stirling boilers, one Hamilton-Corliss single-cylinder engine, belted to two 300-kw General Electric four-polars set up in line with each other, and connected by clutch couplings to the central pulley. This equipment will necessarily be increased as the traffic grows, and on account of the length of the lines polyphase apparatus will probably be put in. The power station is of sufficient size to accommodate large extensions. 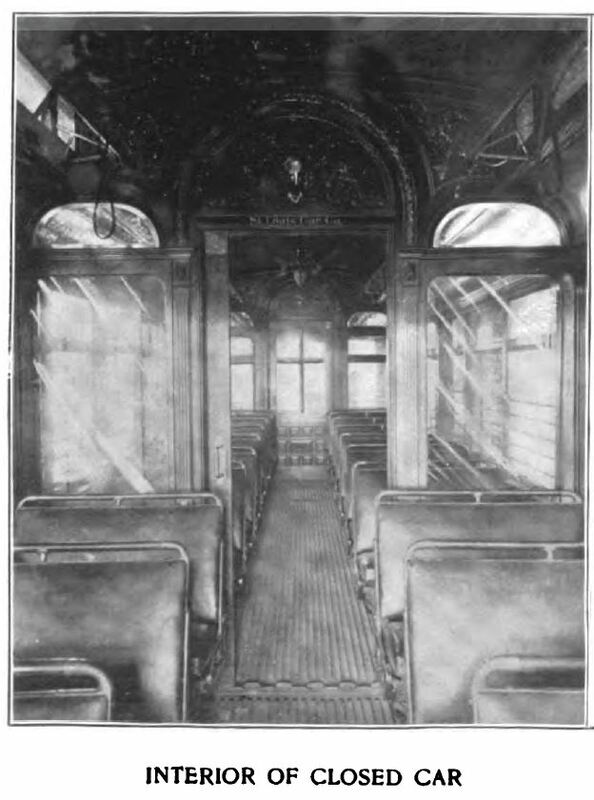 The line was built by the Cleveland Contracting Company, of Cleveland, Ohio, which company is interested in several interurban electric railway properties in different parts of the country, among them the Tiffin-Fostoria line, the Hamilton-Cincinnati line, and others. 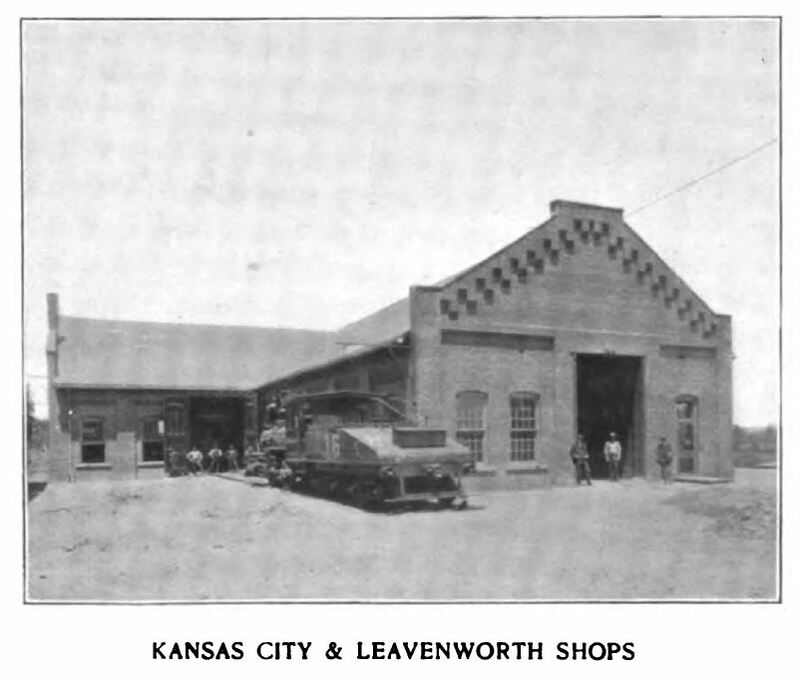 The officers of the Kansas City-Leavenworth Railway Company are: President, D. H. Kimberley; vice-president, W. H. Gabriel; secretary, C. O. Evarts, all of the Produce Exchange Bank, of Cleveland, Ohio. The general manager of the road is H. W. Wolcott, of Wolcott, Kan. 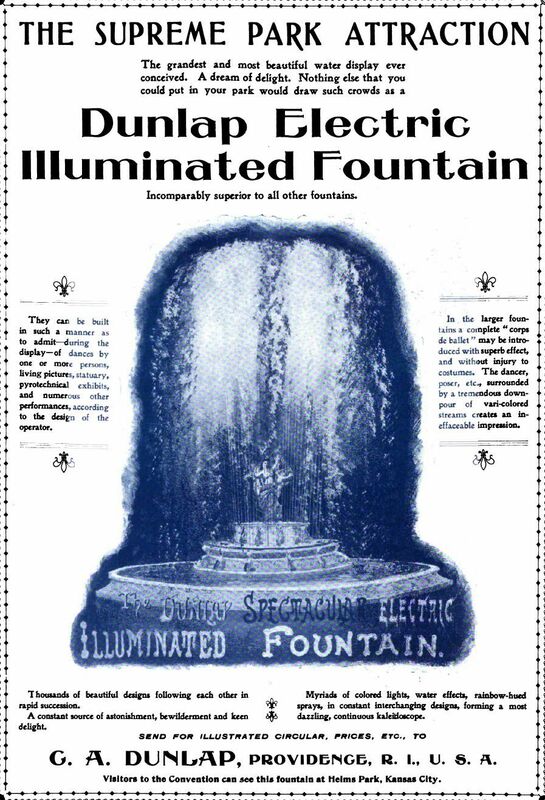 The electric illuminated fountain, illustrated on this page, opens a new field of attractions for trolley parks and other summer resorts. The original idea of combining tableaux viivants with a display of brilliantly illuminated falling water is one that has already taken the fancy of the amusement-seeking public wherever it has been introduced. The fountain shown in the engraving occupies a central position in Heine Park, Kansas City. It is strongly illuminated by electric lights, whose color can be changed at will. The figure, which, in a first glance at the picture, would be taken for a statue, is in reality flesh and blood. While the fountain is in operation, therefore, various poses, or even dances, can be introduced, and the beautiful effect of the graceful, handsomely attired performer, moving amidst a shower of brilliantly sparkling water, can be imagined. The novelty is the invention of C. A. Dunlap, Providence, R. I., who is supplying it to parks and private individuals. Many of the designs are of quite a pretentious character, floor space being provided for the staging of an entire corps du ballet. The space in the center, which is occupied by the performers, is perfectly dry, and permits of a pyrotechnic display in conjunction with the acquatic features.